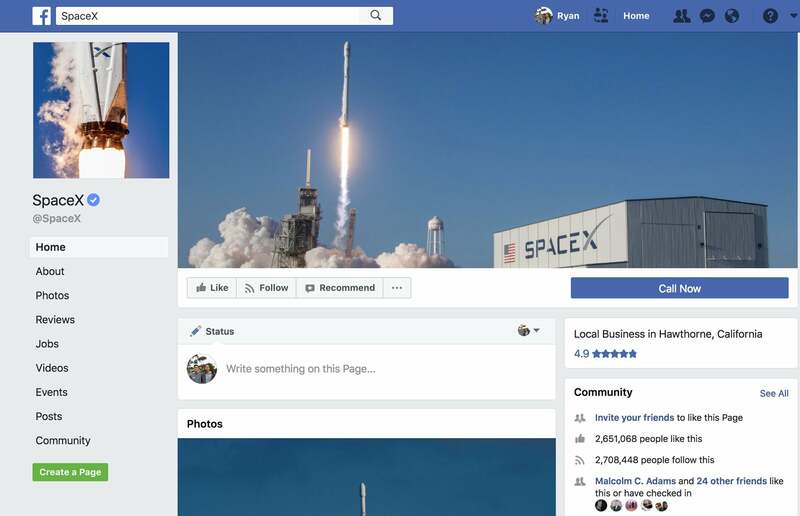 A recent tweet suggests that Elon Musk may be deleting the SpaceX Facebook page – a bizarre occurrence that comes just as SpaceX is becoming a staple in the news due to their focus on bringing a man to Mars, and that may be a reaction to the Facebook data controversy. It’s important to keep in mind that the source for this information regarding the SpaceX Facebook page is just a single tweet and there isn’t much information around the web regarding his decision, but this is a huge shakeup if it does go through, as it removes an avenue of communication with the public and shows the company’s firm stance towards the questionable decisions Facebook has made regarding user data – revealed after the Cambridge Analytica leak gave us insight into the shocking ways our personal information was being used. Included below is a tweet from a user to Elon Musk regarding the SpaceX Facebook page, after Elon Musk responded to a tweet on the hashtag #deletefacebook with the sarcastic response “What’s Facebook?” There has been a large amount of criticism in the past few days as it comes to light that Facebook – whether knowingly or not – played a large part in supporting micro-targeted political ads that may have had a large influence on the outcome of the most recent election. There’s a saying that suggests that if you’re not paying for a product that you yourself are the product, and while it was known for a long time that Facebook made their money off of user data and advertisements, many weren’t aware of the extent to which this data was stored and used. Elon Musk has been a strong proponent of morality and responsibility from both companies and individuals, and his decision to delete the SpaceX Facebook page is a strong statement that he and his company are in opposition to the way that user data is being treated. Elon Musk is also the owner of Tesla, the self-driving electric car company, and it remains to be seen whether action will be taken to delete the Tesla Facebook page as well – or if this decision is just isolated to the SpaceX Facebook page. UPDATE: Elon Musk has since deleted both the SpaceX and Tesla Facebook pages. It appears as if there was substance behind his tweets. Musk seemed unaware that the pages had even existed, and took quick action to delete them – a bold move that is a direct response to this recent controversy. While a business page such as that for SpaceX and Tesla probably doesn’t have as much to worry about in terms of personal information being leaked, it’s a strong show of solidarity from an influential man and company that seem to have a commitment towards conducting themselves on the up-and-up. While Facebook is already all over the news due to the Cambridge Analytica scandal, such a prominent company that has been a big part of the news cycle as of late taking the steps to delete both the Tesla and SpaceX Facebook page is sure to add more unwelcome attention to the behavior of the social media giant.